Kangwon Land Resort surrounded by hills and a relaxing man made pond. 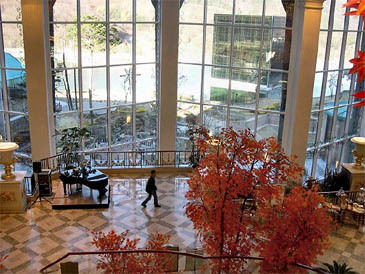 If you're looking for a little bit of Vegas in South Korea without having to fly over 10 hours, check out this five-star resort located in the highlands of Gangwon Province near the majestic Mt. Baekun. Kangwon Land is a world-class hotel and resort combining European style villas with the flare of Las Vegas in a picturesque location where every room in the hotel offers an incredible view of the beauty of its surrounding hills. World award winning chefs offer delicious and exquisite foods that will make your mouth water days later. The World Fusion Restaurant located on the third floor offers buffet for breakfast, lunch and dinner with a-la-carte dishes offered. Boasting South Korea's largest casino is one thing but to live up to the hype is another and Kangwon Land lives up to the hype with 132 table games and 960 slot machines and video game devices. 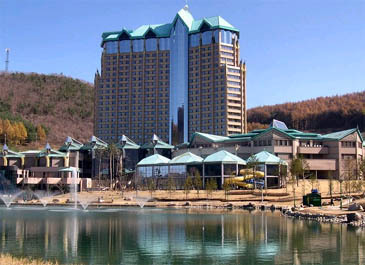 Kangwon Land is the only casino in the nation where natives and foreigners can play together side-by-side. Guests who eat at the Cafe Lounge at Kangwon Land Resort are treated to a beautiful look outside the huge windows while enjoying their meal. 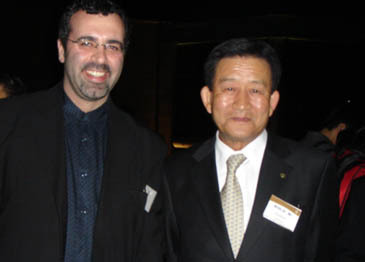 The friendly dealers are multi-lingual and will speak in either Korean or English amongst other languages. It was outstanding to observe the dealer speak in three different languages while I was playing Black Jack. To me the dealer spoke English, to my neighbor he spoke Chinese and he addressed the rest of the table in Korean. 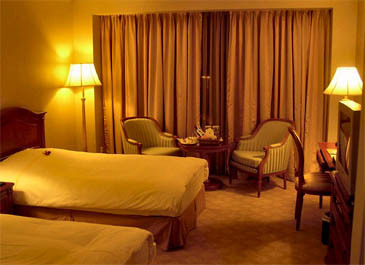 In addition to the hotel's splendid interior its design offers a safe and pleasant casino environment for all players. The recent expansion of the casino has now a non-smoking area of 81 percent of the entire floor. There is a limitation of 15 days a month on gambling in order to prevent addictive problems and also an on-site "Problem Gambling Center — which provides counseling and treatment for gambling addiction. Kangwon Land offers five types of games: Blackjack, Baccarat, Roulette, Tai-Sai, Big Wheel and the traditional casino Slot Machines as well as interesting video games. There is also an on-site buffet as well as a VIP Lounge. Drinking is not permitted in the casino but there is a healthy supply of fruit juices, coffee, tea, and soft drinks. The hotel part of the resort features a total of 676 rooms out of which 477 of them are suites and also includes a Presidential Suite and 10 deluxe restaurants which are hosted by gold medal winners of world-famous cooking contests, as well as various facilities including a swimming pool, sauna, fitness center and luxury shop. The 24-floor hotel has various suites available ranging from the "standard" at a reasonable rate to the ultimate in luxury, the Presidential Suite. The rooms offer everything a guest will and might need such as toothbrushes, razor, and in-house laundry services. There are safes in every room and a genius remote control that controls everything in the room from climate control to all the lights. With this kind of luxury one never has to leave their bed. With that in mind, room service is also provided. There are three different kinds of banquet rooms with the largest being a 1,000 person, five-language simultaneous interpretation system making Kangwon land a ideal place to host international conventions in which many languages might need to be translated. What would a Vegas type resort be without a theme park? Kangwon Land offers a state of the art concept, which includes virtual reality rides such as the "3D Motion Theater" and "Alien Adventure." 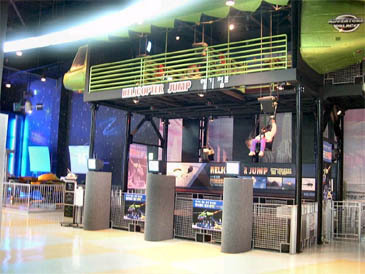 The theme park has eight kinds of riding machines including the entertaining high-tech simulator "Helicopter Jump." For the not so bold who haven't tried extreme sports and still want to experience the rush from jumping out of a helicopter can get their adrenaline flowing by being suspended in mid-air while trying to navigate their decent through 3D goggles. Besides all the high-tech fun there is even the more traditional ride in which no amusement should be without, bumper cars. In total, Kangwon Land Theme Park has 26 rides which are sure to thrill not only the kids but the child in all of us. If the casino, theme park, and restaurants are not enough, guests can enjoy attractions such as a magic show, clown show, puppet show and musical performances. The future looks bright for Kangwon Land. By July 2005 they plan on opening up an 18-hole, par 72 golf course. The golf course is the highest-altitude of its kind in Korea (approximately 1000m above sea level). It will meet world standards for international championship games with challenging courses that will have ten lakes, two streams and 65 bunkers. Also on the horizon is an 18-slope ski resort with four gondolas, five lifts, and 403 condominium rooms. The longest slope will be 21 km with an altitude difference of 650 meters. Kangwon Land plans on various course levels to attract diverse skiers. The ski resort's planned grand opening will be in December 2006. Even with everything this five-star resort has to offer there are also many travel locations around Kangwon Land that are worth visiting. Within a short drive in any direction, travelers can visit temples, museums and folk villages that make the southern part of Gangwon Province truly a charming vacation spot for either a week or a few days. Within a 15-minute drive from Kangwon Land, visitors can check out Jeongam Temple. Known for its pagoda atop a mountain, Jeongam Temple is a perfect place to enjoy the tranquility of the mountains. A short climb to the top of the mountain and one will be rewarded with a breathtaking view of the surrounding hills. Any season is a perfect time to visit because with every season brings a new appreciation for the peaceful surroundings one can find in this temple retreat. 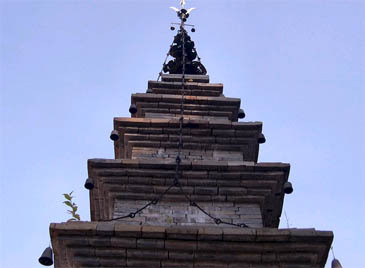 The pagoda itself was built with bricks at a time when machines were not available to carve out the perfect rectangular pieces needed to assemble such a delicate monument. 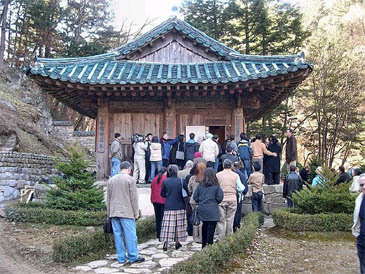 After a peaceful visit at Jeongam Temple one should go visit the Dangun Temple in the Taebaek Mountains. 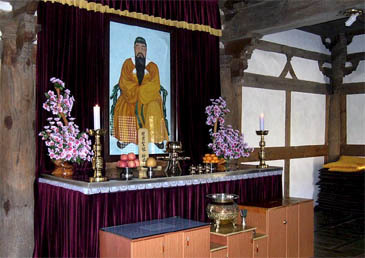 Dangun Temple is a shrine in honor of the grandfather of Korea. According to popular myth, Dangun was the offspring of a bear and tiger who were placed in a cave. In the temple, visitors can admire Dangun's spirit and portrait which is the symbol of a divided nation. Around the temple one is reminded of how this man transcends religion and ideology. Dangun Temple is a must see for anyone who loves Korean history and folklore. 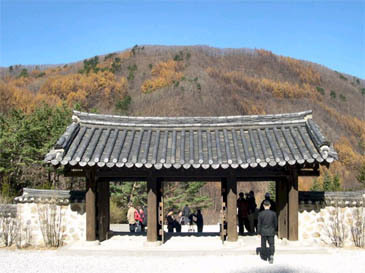 The temple in the Taebaek Mountains is dedicated to Dangun, the national founder of Korea and the offspring of a the union of a bear and tiger. Just beside and sharing the same parking lot with Dangun Temple is the Taebaek Coal Museum. This entire area used to be a thriving coal mining area but once the floor fell from under the coal mining industry a new industry known as travel was born. The Taebaek Coal Museum relives the old days when the money from the coal industry was the number one provider for most of the inhabitants of Southern Gangwon Province. What is fascinating about the museum is not its namesake. The museum doesn't only look at the history of coal; it gives visitors a look at geology with samples of many different kinds of stones from around the world. Its biggest draw is its extensive fossil collection not to mention its crystal collection which might keep you staring for hours. No trip to Kangwon Land and its surrounding beauty would be complete without a visit to Arari Village Theme Park situated in Jeongseon County just north of Kangwon Land. Located in the middle of the Taebaek Mountains, Jeongseon boasts natural scenic beauty with the Auraji River alongside its boundaries. The uniquely calm and peaceful surroundings have formed their own housing culture and industrial activities over many generations. 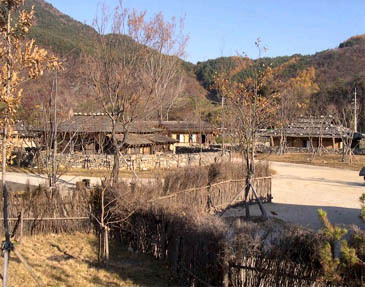 The Arari Village Theme Park is an exhibition area where visitors can stay a few days and see what the people were like in a rural village during the Joseon Dynasty. 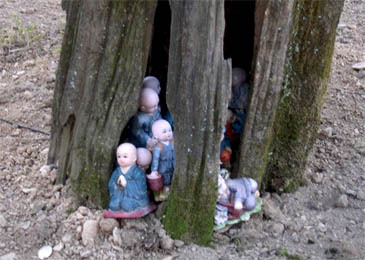 In addition to mementos like Seo-nang-dang (a shrine in honor of a deity) and jang-seung (totem poles) located at the entrance to the village, yeon-ja-bang-a (a millstone usually worked by an ox) and a farming tool workshop display, the theme park is designed to show how the people living in this area were engaged in their community. 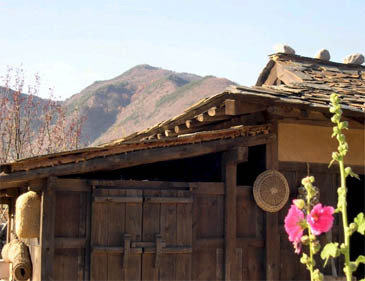 Houses made of gulpi (oak bark), gyeoreup (peeled hemp stalks) logs and stones also show how their architectural culture developed, maintaining local and social characteristics. Not only that, visitors will find everyday household items enabling them to see the features of the region and the nation's past. Traditional houses in the theme park were built on the basis of meticulous historical research. 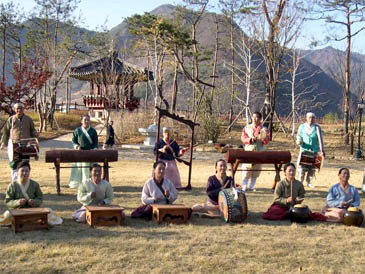 It will also be a unique experience to see the market place and playground of the Joseon Dynasty (1392-1910) located in the middle of the village. One interesting site to see is the beginning of the Han River situated just behind the Arari Village Theme Park. 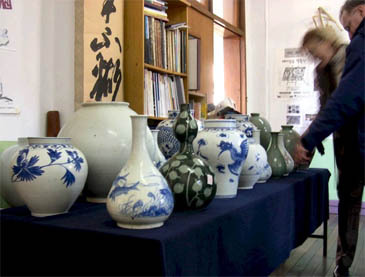 Also worth a trip is the Jeongseon Gallery. This place used to be a school but they eventually changed it into an art gallery so that locals can show off their works. There are still art classes in the building but for the most part it's a museum where visitors can enjoy the art of local painters, sculptures and artisan makers. With everything Kangwon Land has and will have to offer, every guest from the youngest to the oldest can enjoy something at the resort and its surroundings. Kangwon Land is not about gambling, it's about everyone having their own kind of fun at their own pace. 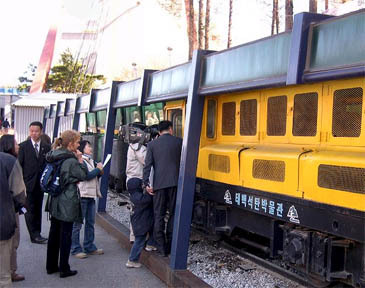 To get to Kangwon Land from Seoul using the train, go to Cheongnyangni Station and take the train to Sabuk Station. From Sabuk Station walk down the hill until you see the sign for Kangwon Land. At the sign take the shuttle bus to the resort. By bus go to the East Seoul Terminal at Gangbyeon Subway Station and take the bus for Gohan Terminal. There are also flights from Incheon International Airport to Yangyang International Airport. The easiest and best way in my opinion is taking the train, which will take about four hours and cost about 20,000 won. The main prayer hall at Jeongam Temple was built to protect the Sumanotap Pagoda in front of it were the sari (the calcified remains of a holy person after cremation) of Sakyamuni, the Historical Buddha is enshrined. 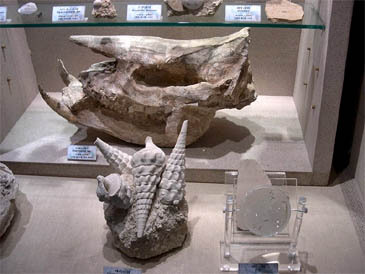 Fossils at the Taebaek Coal Museum gives visitors a glimpse of the earth's stones and minerals and how coal was mined. 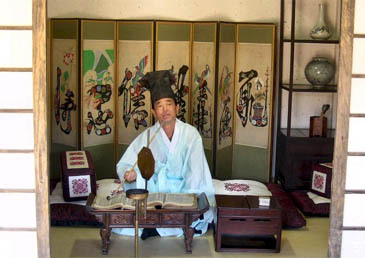 Actor at the Arari Village Theme Park give visitors a feel for what it was like in the olden days in Korea. 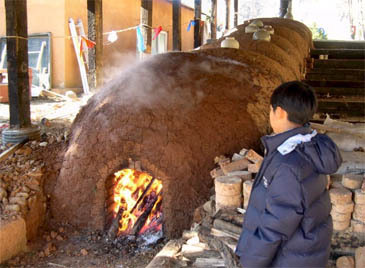 A boy stands in front of a pottery kiln at the Jeongseon Gallery in Jeongseon County.